In case you missed it yesterday, this week is National Surveyors Week! 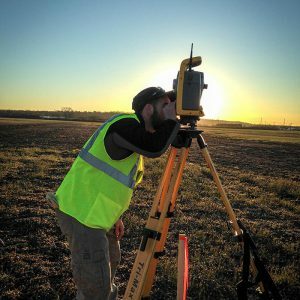 The Kleingers Group couldn’t be prouder to be one of the largest surveying operations in the state, and this week we are focusing on some of our lesser known services in celebration. First up: 3D laser scanning. The Kleingers Group has been active in 3D laser scanning for the past eight years and in 2011 formed a separate organization, Truescan3D, as a division of The Kleingers Group. data allows us to create 2D plans or 3D models of the building or environment. Point cloud data is typically useful for architects, engineers and contractors who need to know the exact measurements of a building or piece of machinery and not the measurements listed on plans of what was supposed to be built, but more and more, many new uses for the data are beginning to pop up. 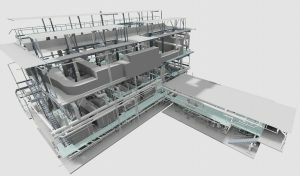 Since the point cloud provides a complete digital record of a space, it can help verify all sorts of information including the slope of the floor, the design of the steel structure, how HVAC is routed and much more. What are the benefits of 3D laser scanning over hand measurements? No form of measurement available today is more accurate than 3D laser scanning. In just a matter of days or even hours, scanning provides a 3D point cloud with precise 3D data points, virtually eliminating error and need for change orders. 3D laser scanning is more expensive than hand measurements. Is it worth it? If you have a small, easy to measure space that won’t need many improvements, probably not. But for large or complex sites, 3D laser scanning usually saves money in the long run. First, by virtually eliminating error, 3D laser scanning can drastically reduce change orders and waste. Prefabricated materials are built correctly the first time. 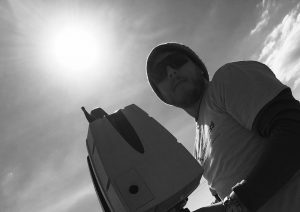 Second, because 3D laser scanning produces a complete digital record questions that arise late in the game are easy to answer. Return visits to the site are virtually eliminated because every square inch of walls, floors, ceilings, mechanical systems and architectural components were already captured. Third, 3D laser scanning is non-intrusive and typically doesn’t require industrial facilities to shut down in order to perform scanning operations. Since it is fast, it can be performed during off hours and it keeps staff out of harms way by eliminating the need for direct contact with hard to reach features or energized equipment.